If you're looking for a great (and cheap!) hotel in Minneapolis - St. Paul, CheapTickets is the best place to find them. We offer deals on the best 322 hotels throughout Minneapolis - St. Paul. No matter what you're looking for, we have options for you. Grab great rates on the 121 affordable 3-star hotels that are easy on the wallet without sacrificing comfort. Looking for more luxury? Try one of the 23, 4-star hotel accommodations in Minneapolis - St. Paul. No matter your budget needs, we've pulled out all the stops to make sure you have plenty of vacation options. Maybe you prefer to search for your hotel deals based on what each hotel offers? For example, let's say you just want to find a hotel or resort that has a pool to cool off in after a long day exploring Minneapolis - St. Paul. Scroll down to choose from the 225 hotels in Minneapolis - St. Paul that has a pool for guests. Or search for deals on Minneapolis - St. Paul hotels offering free wifi or breakfast, non-smoking rooms, and more! CheapTickets is here to be your personal travel agent for your next trip to Minneapolis - St. Paul. Get booking today! What hotels in Minneapolis - St. Paul offer free wifi access? Are there deals on Minneapolis - St. Paul hotels offering free breakfast? Yes! The only thing better than finding a great deal on a cheap hotel in Minneapolis - St. Paul is finding one that offers free breakfast. Grab some eggs, a waffle, or some healthy oatmeal before a day full of exploring Minneapolis - St. Paul and all that it has to offer. Below are just some of the many hotels that offer free breakfast in Minneapolis - St. Paul. 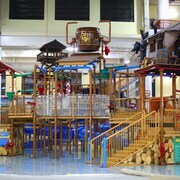 Key Inn is a 2.00 star rated hotel property in Minneapolis - St. Paul that offers free breakfast. Crowne Plaza Aire MSP Airport - Mall of America is a 3.50 star rated hotel property in Minneapolis - St. Paul that offers free breakfast. LivINN Hotel Minneapolis South / Burnsville is a 2.50 star rated hotel property in Minneapolis - St. Paul that offers free breakfast. Super 8 by Wyndham Bloomington/Airport is a 2.00 star rated hotel property in Minneapolis - St. Paul that offers free breakfast. What about deals on pet-friendly hotels in Minneapolis - St. Paul? Minneapolis - St. Paul is a great place to get outside and explore with your pets in tow so don't leave your furry friends behind. Below you'll find great deals on hotels in Minneapolis - St. Paul that allow pets. Don't forget to bring plenty of treats! Motel 6 Minneapolis Airport - Mall of America is a popular, pet-friendly, 2.00 star hotel in Minneapolis - St. Paul. Hilton Minneapolis is a popular, pet-friendly, 4.00 star hotel in Minneapolis - St. Paul. Radisson Blu Mall of America is a popular, pet-friendly, 4.50 star hotel in Minneapolis - St. Paul. Motel 6 Minneapolis North - Roseville is a popular, pet-friendly, 2.00 star hotel in Minneapolis - St. Paul. Any good rates on Minneapolis - St. Paul hotels with restaurants? Absolutely. Don't want to deal with planning our all your meals on your trip to Minneapolis - St. Paul? We don't blame you. Keep the hangry away by staying in one of the 99 hotels that have restaurants. With a room at one of these spots, all it takes to get a good meal is hopping in the elevator. Check out some of the most popular hotels in Minneapolis - St. Paul that have restaurants below. Book Country Inn & Suites by Radisson- Bloomington at Mall of America- MNCountry Inn & Suites by Radisson- Bloomington at Mall of America- MN is a 3.00 star hotel and has one or more restaurant options. Book Radisson Blu Minneapolis DowntownRadisson Blu Minneapolis Downtown is a 4.50 star hotel and has one or more restaurant options. Book Hyatt Regency Bloomington - MinneapolisHyatt Regency Bloomington - Minneapolis is a 4.00 star hotel and has one or more restaurant options. Book Hyatt Regency MinneapolisHyatt Regency Minneapolis is a 4.00 star hotel and has one or more restaurant options. What are the cheapest hotels in Minneapolis - St. Paul with pools? What's better after a long day exploring Minneapolis - St. Paul then a relaxing dip in a pool? Finding the Minneapolis - St. Paul hotel you need for a bargain! Cool off and unwind at one of our 225 Minneapolis - St. Paul hotels with a pool. Browse some of the top deals on these hotels and resorts with pools in Minneapolis - St. Paul below, but be warned: You may not want to check out! Graduate Minneapolis has a pool and a 4.00 star rating. Embassy Suites by Hilton Minneapolis Airport has a pool and a 3.50 star rating. Loews Minneapolis Hotel has a pool and a 4.50 star rating. Mystic Lake Casino Hotel has a pool and a 3.50 star rating. What hotels in Minneapolis - St. Paul offer parking for guests? Once you've made your way to Minneapolis - St. Paul, the last thing you want to deal with is finding parking close to your hotel. Avoid the hassle of parking around the block and carrying your luggage all the way to the lobby by booking one of our hotels with parking. Check out deals on some of the 241 hotels in Minneapolis - St. Paul that offer parking for guests. La Quinta Inn & Suites Mpls-Bloomington West This hotel has a 3.00-star rating. Motel 6 Minneapolis - Brooklyn Center This hotel has a 2.00-star rating. LivINN Hotel St. Paul - I-94 - East 3M Area This hotel has a 2.50-star rating. Best Western Regency Plaza Hotel - St. Paul East This hotel has a 3.00-star rating. Do Minneapolis - St. Paul hotels offer 24-hour concierge services? When you're on vacation, things don't always go according to plan. Travel with peace of mind when you book one of our 44 hotels in Minneapolis - St. Paul with 24-hour concierge service. That way you know help is always phone call or elevator ride away. Try JW Marriott Minneapolis Mall of America. It's a 4.00 star rated hotel in Minneapolis - St. Paul that offers concierge services 24 hours a day. 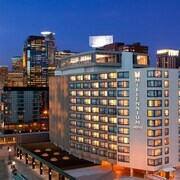 Try The Hotel Minneapolis- Autograph Collection. It's a 4.00 star rated hotel in Minneapolis - St. Paul that offers concierge services 24 hours a day. Try The Saint Paul Hotel. It's a 4.00 star rated hotel in Minneapolis - St. Paul that offers concierge services 24 hours a day. Try GuestHouse Bloomington. It's a 3.00 star rated hotel in Minneapolis - St. Paul that offers concierge services 24 hours a day. What about low rates on non-smoking hotels in Minneapolis - St. Paul? Mystic Lake Casino Hotel This hotel has a 3.50-star rating. The Marquette Hotel- Curio Collection by Hilton This hotel has a 4.00-star rating. Millennium Minneapolis This hotel has a 3.50-star rating. Hyatt Place Minneapolis Airport-South This hotel has a 3.00-star rating. What are the cheapest Minneapolis - St. Paul 3-star hotel deals? Our 3-star hotels bring you quality accommodations at a lower price point for the perfect, budget-friendly vacation in Minneapolis - St. Paul. With 121 3-star hotels throughout Minneapolis - St. Paul to choose from, you still have options. Browse our selection below. Millennium Minneapolis. Linked by skyway to the convention center, this hotel is adjacent to Nicollet Mall, downtown's main shopping artery, and 9 blocks from the Warehouse entertainment district and Hennepin theater district. La Quinta Inn & Suites Mpls-Bloomington West. This 17-story hotel is 6 miles from the Mall of America, 9 miles from Minneapolis–St Paul International Airport, and 12 miles from downtown Minneapolis and the Minneapolis Convention Center. 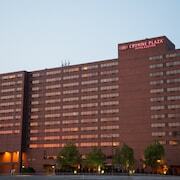 Crowne Plaza Aire MSP Airport - Mall of America. This family-friendly Bloomington hotel is located near the airport, within 1 mi (2 km) of Minnesota Valley National Wildlife Refuge and Sea Life Minnesota Aquarium. Mall of America is 1.3 mi (2.1 km) away. Best Western Regency Plaza Hotel - St. Paul East. Situated in Oakdale, this hotel is within 9 mi (15 km) of StoneRidge Golf Club, Xcel Energy Center, and Indian Mounds Park. Fitzgerald Theater and Landmark Center are also within 9 mi (15 km). What are the best deals on 4-Star Hotels in Minneapolis - St. Paul? Minneapolis - St. Paul is full of hotels and it can be hard to narrow down where you really want to stay. Luckily, we've done that hard work for you be narrowing you from 322 hotels throughout Minneapolis - St. Paul, to the 23 4-star hotels in Minneapolis - St. Paul. Our 4-star hotels in Minneapolis - St. Paul are exactly what you need for your next family trip, romantic weekend, or solo getaway. Check out our most popular deals below. Hyatt Regency Bloomington - Minneapolis: Situated near the airport, this hotel is within 1 mi (2 km) of Minnesota Valley National Wildlife Refuge and Mall of America. Sea Life Minnesota Aquarium and Water Park of America are also within 2 mi (3 km). Radisson Blu Minneapolis Downtown: This 17-story downtown hotel was renovated in June 2014, and is 2 blocks from the Target Center concert venue and the Theater District. It links via the Skyway System to shops, restaurants, businesses, and entertainment. W Minneapolis - The Foshay: Located in Downtown Minneapolis, this luxury hotel is within a 10-minute walk of Mary Tyler Moore Statue and Target Center. Target Field and Basilica of Saint Mary are also within 1 mi (2 km). Hyatt Regency Minneapolis: Situated amid the retail and dining of Nicollet Mall, this downtown Minneapolis hotel is 8 blocks from the theater and entertainment districts. The University of Minnesota is less than 4 miles away. What are the best activities to do in Minneapolis - St. Paul? Girlfriend Getaway Package at Mall of America: Starting at just $95 per person. SEA LIFE Minnesota Aquarium: Starting at just $21 per person. Dining at Hard Rock Cafe Mall of America with Priority Seating: Starting at just $35 per person. Twin Cities Trolley Tour: Starting at just $50 per person. It was great, as usual. I don’t know what else to say. We had a nice extended weekend here. The room was VERY nice and VERY clean! We thought it was a little closer to some main bars and restaurants, but Lyft worked just fine. We were disappointed by the service received at the hotel bar 3 of the 4 nights we were there, and the prices were outrageous for food and drinks. Was also disappointed that the pool area is only open until 10PM, with no adults only time. Overall, our stay was nice and would consider booking again. How close it was to MOA, close enough to walk or drive. Also they have a shuttle service. It was a great, comfortable stay. The location was super close to the airport and I was so grateful for the Free Airport Shuttle. Just awesome.